Do not be fooled by Digi Docket. It only resembles a reliable and trustworthy application, and in reality it is one of the more unreliable programs you could install yourself. Trojans, rogue malware removers, keyloggers, and other dangerous threats can attack your PC without your permission, and Digi Docket needs your consent to enter your PC. Unfortunately, in most cases, computer users do not realize this and install the app completely accidentally. In either case, you need to remove Digi Docket. 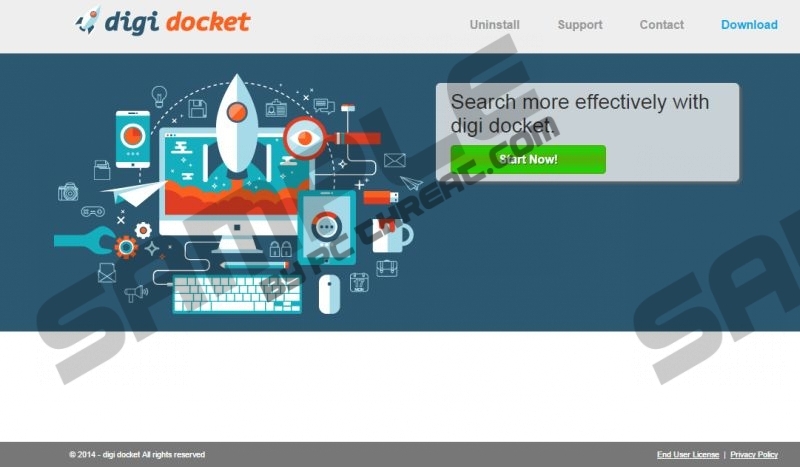 We are 100% sure that you have not installed Digi Docket yourself from digidocket.net; at least not recently. The website is not active, and this is not surprising at all. All applications created by SuperWeb LLC, including Byte Label and Masponi, do not have official downloaders. Instead, their installers are bundled with the installers of other programs. Due to this, we believe that most computer users who are trying to delete Digi Docket will also need to remove a bunch of other unreliable programs. Are you confused about why the removal of Digi Docket is so important? Here’s a rundown. If you do not delete Digi Docket, the program will contact adware servers and enable the presentation of online ads that will appear on the web pages your browse. These ads may be attractive, because they might be produced using the information collected when spying on your browsing history. Unfortunately, the ads may be misleading, and their creators may have mischievous intentions. Most users firstly consider the manual Digi Docket removal. We do not want to discourage you from this removal option; however, we want to warn you that you ought to be careful. Not all users will be able to delete Digi Docket themselves, and even fewer users will have the ability to catch and remove the more aggressive apps that might travel bundled with this adware. This is not something you should ignore, because the PUPs or malware installed together with Digi Docket may be even more dangerous. You can remove Digi Docket and the rest of the threats using one single tool – SpyHunter. This is a legitimate security tool which you can install from this page. Simply click the download button and follow the presented instructions. Automatic malware removal software will delete Digi Docket together with the associated malware and will reinstate the protection of your operating system. This is the software that we recommend installing even if you have deleted Digi Docket manually. Click and Remove the undesirable program Digi Docket. Click Uninstall a program and locate Digi Docket. Simultaneously tap Win+R (RUN) and enter Control Panel. Quick & tested solution for Digi Docket removal.